The first thing that comes to the attention of most travellers is the country’s national drink. In Mexico, it was a tie between tequila and Corona, while the Argentinians made no secret of their love of “vino tinto” (red wine). 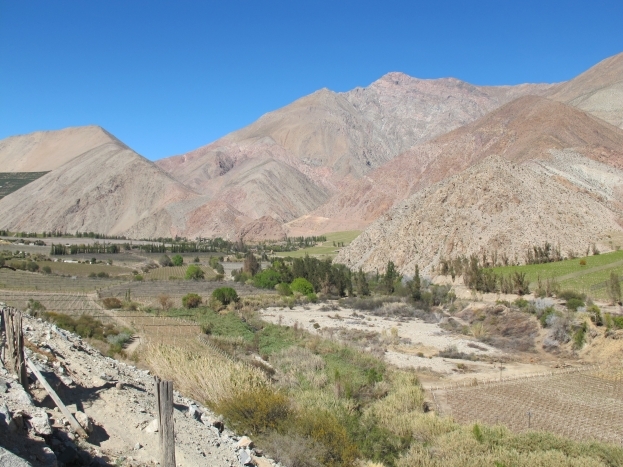 For Chileans, it’s all about pisco, most of which is brewed in the Elqui Valley in the country’s north. We stopped at nearby La Serena on our way to the Bolivian border and spent a day on a tour of the Elqui Valley – it was a beautiful spot. 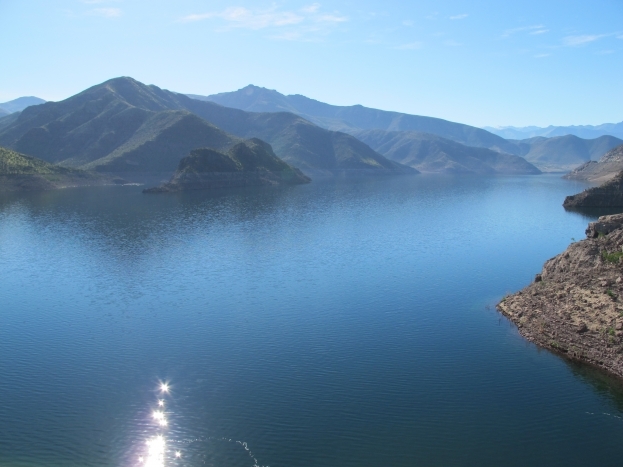 Elqui means “narrow”, which is the perfect word to describe the fertile valley that stretches between two mountain ranges. Small villages support the vegetable farms and grape orchards that line the valley floor. Our tour guide, Roberto, gave us a thorough look at the whole area. First stop was a papaya and artichoke farm, then we checked out the damn that supplies the local farms with water and hydro-electricity. As we made our way through the small villages that line the mountains, we watched teenagers in traditional dress dance in the street, in preparation for Chile Independence Day on September 18. Every local we’ve met has urged us to stick around for the country’s biggest party, but unfortunately we haven’t got enough time. Luckily for us, Chileans like to stretch out a party, so we go to see the beginnings of the celebrations in the Elqui Valley. Before lunch we stopped at Chile’s oldest pisco distillery for a tour and a sample. Pisco reminds me of tequilla – a small sip warms your mouth and throat on its way down. The most popular way to drink it is in Pisco Sour, which is made with crushed lemons, sugar and pisco, and tastes simillar to a Margarita. Here’s our tour guide Roberto dishing out some tiny tasters. Lunch at the Restaurant Solar was a highlight. 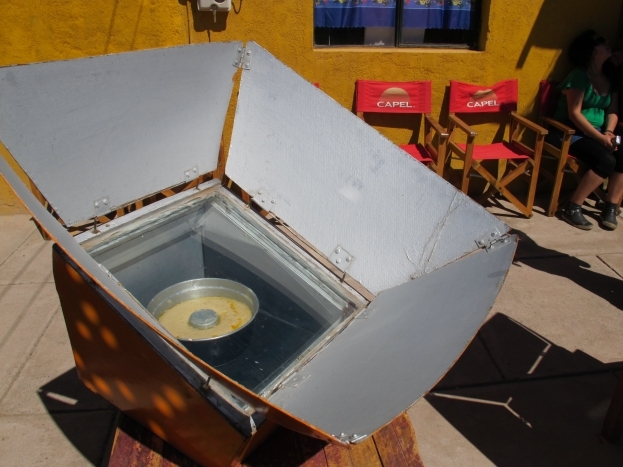 They cook most of their food in solar ovens that line the verandah in front of their restaurant. 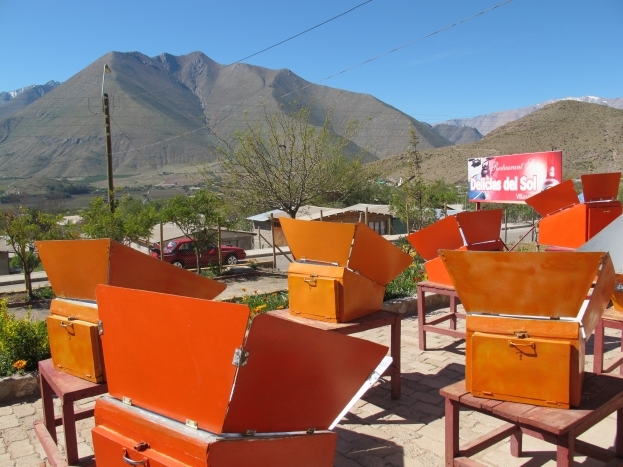 The warm midday sun heats them to 180 degrees, which is perfect for making traditional Chilean dishes, such as stewed goat, and roast chicken. We even got to watch our dessert cooking! The Elqui Valley is heralded as having the clearest skies in the world, and the peaks of its mountain ranges make for perfect astronomical viewing. 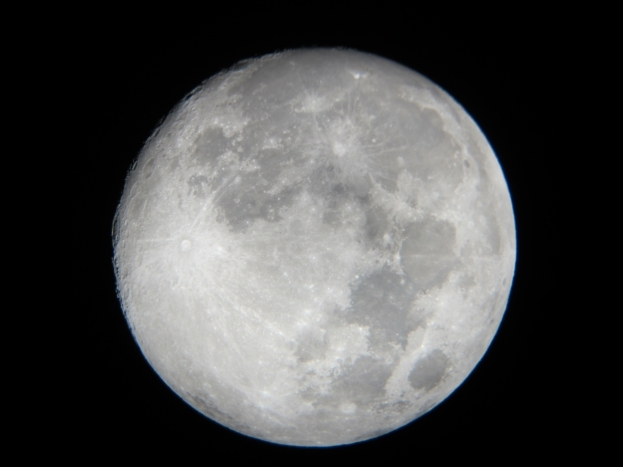 We spent the eveing at the Mamalluca observatory, using giant telescopes to look at Saturn and at the surface of the moon. Being in the southern hemisphere, the Southern Cross was an obvious point for discussion, and a nice reminder that even though we’re on the other side of the world, we’re not that far from Australia.